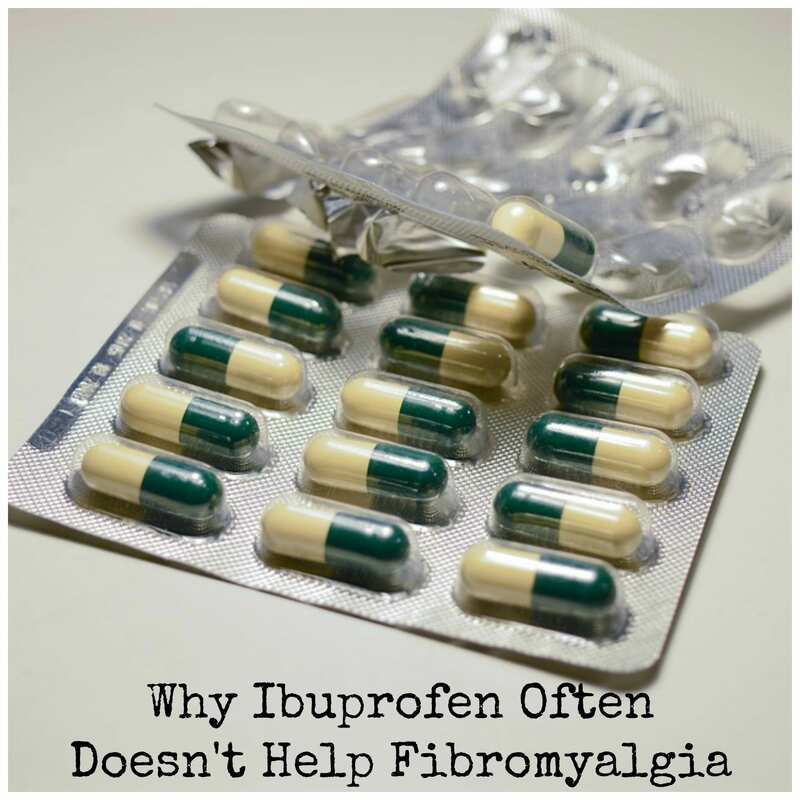 Does Ibuprofen Help With Fibromyalgia Pain? Early on, in my battle with chronic pain, I tried what I thought was a quick and “easy” solution. I took a couple of ibuprofen. Then, I waited to feel better. Instead, nothing happened. Nothing at all. This over-the-counter medicine didn’t touch my pain. That made me a little worried. What was I dealing with, that ibuprofen didn’t touch? Instead, though, I should have been asking something else. Why did I want to take this drug long term anyway? Wouldn’t it be much better to get to the root of the problem, and treat it naturally? Shortly after realizing that ibuprofen wasn’t going to help, I met a woman at my son’s baseball game. Her skin was a ghastly shade of white. It was clear she wasn’t well. But she was happy to be alive. That’s because she had arthritis. She took ibuprofen. And it caused a rare but oftentimes fatal reaction called Stevens-Johnson syndrome, in which the skin blisters and peels off. That was all I needed to know. I decided to never again take ibuprofen. The fact that it didn’t work for me, anyway, made it that much easier. Now that I have a much better sense of what I’m dealing with, I know ibuprofen wasn’t appropriate for what I was dealing. It wasn’t going to touch my nerve pain. Nor was it going to address the root cause of my problem. It certainly wasn’t going to improve my overall health, either. I also made a decision not to take any other drugs either. This is my general principle, unless a situation is life threatening. I’m not altogether anti-drug. That’s because I realize they can and do save lives. However, I wasn’t dealing with a life-threatening situation. Any drugs I took would be a matter of comfort. That’s if they worked. If they “worked,” they would temporarily ease my symptoms. But at what cost? The list of side effects on some of these prescriptions is daunting. Would I just be trading one problem for another? Should I Take Ibuprofen for Fibromyalgia? Aside from my concern of potential side effects, I knew drugs have their limitations. They may relieve symptoms. But holistic healers often complain this is all they do. They generally don’t hit the root cause of the problem. Poor health can arise from nutritional deficiencies, an overload of toxins and stress. However, this is also a good time to point out that I’m not a doctor. I can’t give medical advice, and I can’t tell you whether or not to take a particular drug. This is something you have to decide, while working with your own healthcare practitioner. All I can do is share my own reasons for not taking drugs. Because everyone is different, I realize that some people are helped by drugs. For them, a prescription regimen is the difference between being able to live a fairly normal life, or being virtually housebound. So, even though drugs definitely weren’t right for me, I understand they may be right for someone else. However, I think it’s also important to point out that prescription drugs generally do not lead to greater wellness. At the same time, natural healing is a lot of work. So, unless someone is ready to make the commitment, and the required lifestyle changes, certain drugs may buy some relief. However, by certain drugs, I’m not referring to ibuprofen. From what I’ve read, and experienced myself, this OTC medication doesn’t help the type of nerve pain I needed to tame. Since I opted to go drug free, I had to come up with a substitute plan. (Or else just accept the pain.) My course of action involved a complete lifestyle overhaul. This was coupled with a wide range of natural remedies, as well as natural healing methods. I can’t promise that what I did will work for anyone else. But what I did is explained in an easy-to-follow video course. Click on the image below for more information.